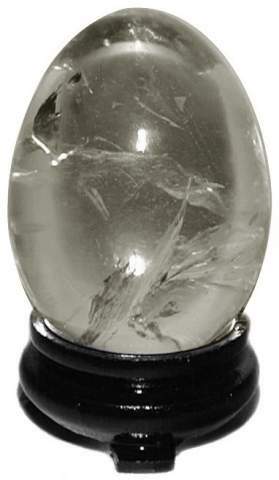 Extra clear A Quartz Crystal eggs from Madagascar. These eggs have excellent clarity with some fine veils, phantoms or small rainbow inclusions and a fine polish. The best quality, high energy quartz comes from the mines of Madagascar off the coast of Africa. Sizes are approximate, eggs are sold by weight. The Wood Oriental Stand is included.